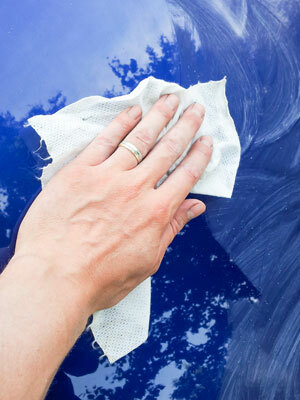 Many car owners are familiar with polishing and waxing a car. However, not many know how to apply car clay, or have even heard of the concept. We’ll explain how car clay works and when and how to apply it. Car clay resembles standard sculpting clay. You apply it to a vehicle to remove surface contaminants after washing a car. This creates a smooth surface, resulting in a better finish when polishing the car. Claying a car is similar to buffing, but is generally considered a safer option because it’s less abrasive. The clay is also safe for use on auto glass and headlights. Apply clay after washing the car but before applying wax. It’s not necessary to apply clay every time you decide to polish. A clay session every six months will usually suffice. We recommend more frequent sessions, however, for those that use their vehicle for off-roading. You might also use it during the winter when the car surface comes into contact with road salt. Most car clays come with a formulated lubricant that you apply in conjunction with the clay. Without lubricant, the clay may scratch the surface as it pulls away the contaminants. It’s absolutely essential to use only the lubricant designed specifically for car clays. Some people improvise by using a regular soap bar or dish detergent. These liquids, including car wash soap, can erode the clay and diminish its ability to remove impurities. If you prefer not to mess with car clay or any of the intricate steps in detailing the car, then bring your car to Bellingham Detail and Auto Glass. We recognize when car clay or buffer needs to be applied to create a perfect surface for waxing and polishing. Posted on May 28, 2017 under in advice | By ignite.